Our 200 thread count Egyptian cotton combines the beauty and look of soft natural cotton, that always feels crisp and fresh, making it an essential product for the better establishments. 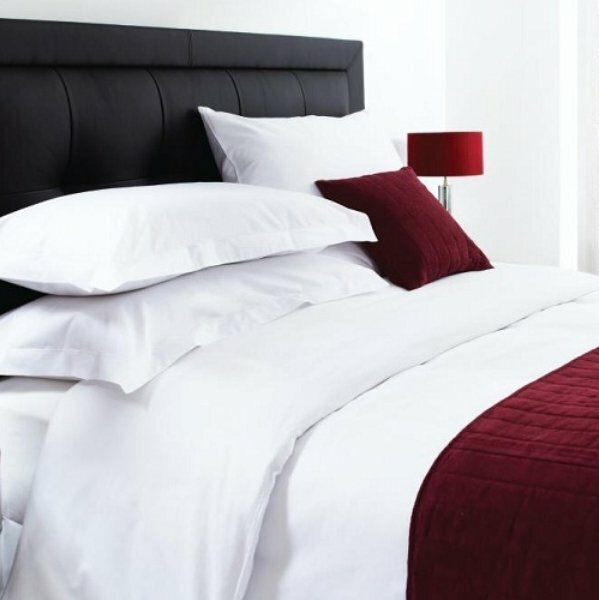 Woven from a superior 200 thread count Egyptian cotton, it is perfect if you want to go the extra mile and offer a more luxurious and softer feel of Egyptian cotton that is undeniably sumptuous to sleep under. Both duvet covers are made with wide shoulders and stainless steel poppers to make changing as fast as possible. NEW fitted sheets with 16 inch 40cm depth and the 50 x 90 pillowcases are available in white only. Good quality sheets with press stud closure making it quick and easy to change the beds. Best ironed whilst damp. Fab price for a pair of pillows. Best ironed whilst damp. Lovely feel to the cotton. Best ironed whilst damp. Excellent value. Wash and wear extremely well. Good quality. Good finish, straight seams so no pulling with pillow in. Good quality but hard to iron.